World War 2 ended in 1945, but rationing and food shortages continued. Housewives worked marvels with their modest rations to feed their families. Here's how! Yet again a chance comment on my Traditional Cheshire food page, by the gentleman- genius Frank Beswick this time about Government cheese, prompted me to make a sideways step to look at a topic this time into WW2 ration food. Rationing continued in Britain until 1954. This was later than almost anywhere else in the world. We often hear about war time food but I decided to have a look at post-war time UK food to make it a bit different. Food was still rationed but surely there must have been a more relaxed atmosphere when family lives weren't in constant, imminent danger and many men had returned from the War in need of feeding. I thought that looking at Post war ration food would give this a different perspective. I included the famous UK war time recipe for Woolton Pie too though ! Where would the Brits have been without it? Do you think people were nutritionally better fed in the 40's and 50's than they are today ? In order to look at post WW2, I felt it would be useful to look at WW2 UK food in order to compare and contrast. There was a huge use of vegetables. Lord Woolton, the Minister of Food during WW2 produced this food recipe for his Woolton Pie to feed the Brits healthily. Nowadays it would be welcomed but at the time, the lack of meat was unpopular. The recipe was invented by Francis Ladry, the chef of the Savoy hotel. There were many versions of this famous UK pie but they always used carrots. It was a mixture of vegetables, a sauce and a topping, which could be pastry or mashed potatoes. Three or Four spring onions; One teaspoonful of vegetable extract and one teaspoonful of oatmeal. Cook all together for ten minutes with just enough water to cover. Stir occasionally to prevent the mixture from sticking. 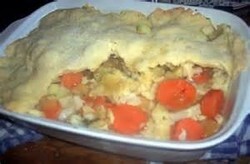 Allow to cool; put into a pie dish, sprinkle with chopped parsley and cover with a crust of potatoes or wholemeal pastry. Bake in a moderate oven until the pastry is nicely brown and serve hot with brown gravy. During WW2, the British government believed that as part of war economies, only a cheap cheddar cheese would be available. All milk produced that normally went to make many different kinds of cheeses, went instead to factories to make the cheddar that became known as Government Cheddar Cheese . The decree banning the production of any cheese but Government Cheddar continued until the end of rationing in 1954. While Government Cheddar helped to get Britain through the war, it also wiped out many farmhouse and local cheese businesses. It took the local cheese producers years to recover and some never did. I decided to look at a few recipes from the late 40's and a few from the early 50's . Many post war recipes had the phrase Americaine after them because America was a good friend to the UK during WW2 and after. Cook the first 6 ingredients together in a pan to bind and make a stuffing. Put inside the herrings. Cover with margarine wrapping papers and bake in the oven Elec 375F for 25 minutes. 1946 saw fuel cuts and there were severe frosts too which damaged the onion and other vegetable crops. The Brit housewives coped in their own way and this recipe appeared in 1946. They made their meagre food rations go even further with little veg to be had. This recipe could be reheated or continue cooking later when there was power back on. 4 ozs prunes soaked for 12 hours in water . Strain the prunes and add stock cube to the water. Whale meat was not rationed and the government were keen for people to try it. In tests most people couldn't distinguish between whalemeat and beef when herbs and seasoning were added. This prompted the joke on the song "We'll meet again " which changed jokingly to "Whale meat again ". Dried bananas were readily available and would be soaked and used with lettuce in a salad or soaked and covered in a batter to turn into fritters. This recipe appeared in 1947. Add to a pan with the chopped rhubarb and simmer for about ten minutes. The Armed Forces were called in to help deliver and distribute food when the dock workers went on strike in 1948,so, the British housewife made use of corned beef as meat rations were further hit. Slice the corned beef, coat in batter and fry. Do not slice the corned beef but brush with melted margarine and roast until hot. As certain foods came off rations and food became more plentiful again, people started to entertain again. Baking became more adventurous too. Note the egg here in this recipe is not dried! This bizarrely named recipe appeared in 1952. Heat the butter, flour and milk to make a thick sauce. Place on triangles of toast. Coronation chicken was invented for the Queen's coronation in 1953. It is a still a firm favourite today. It was a mixture of diced cooked chicken, curry powder, dried apricots, red wine and held together in a light mayonnaise mixture . Frying become a popular form of cooking when fats were de-rationed and were not considered a health hazard as they are today. Ration books were torn up . In June 1945, the meat markets opened early in anticipation of a rush at the butchers! I want to pay a tribute to those remarkable women who managed to feed their families on very little and in many ways the families were better fed than in today's high fat, high sugar, fast food lifestyle which is contributing to the western world's obesity. This WW2 recipe lasted long after the War . In fact my mother in law made it in the 1980'90's for my oldest son who had had an egg allergy. Sieve the flour, baking powder and baking soda together. Mix the flour mixture, condensed milk, melted butter, essence, and water and beat well. Pour the mixture into a greased and dusted 6 inch diameter round tin. Bake in a hot oven at 200 degrees C (400 degrees F) for 10 minutes. Then reduce the temperature to 150 degrees C (300 degree F) and bake for a further 10 minutes. The cake is ready when it leaves the sides of the tin and is springy to touch. When ready, take out from the oven and leave for 1 minute. Invert the tin over a rack and tap sharply to remove. Add the seasoning and the snoek and warm through . I did not eat it much, as our family did not eat it, but I did like it. Mind you, there is not much that I don't like eating, as you know. And I liked blancmange. It was horrible as was blancmange but it was freely available as thickened milk. BUt the people ate what they had to in order to survive. One dessert was junket. This was milk with vanilla heated to body temperature then set with the addition of rennet. It was often served chilled. It was common in the 1950s, but I have not seen it in many years. There are many cheeses much better than Cheddar cheese, a highly uninspiring choice compared to most cheeses. Mum only used it for cooking . Talking of cheese. When government cheddar finished it took years for cheese makers to bring back their cheeses at a price that ordinary people could afford. I can recall the first time that mother managed to buy Cheshire cheese. I had never realized that there were cheeses other than cheddar. Talking of fish. I have never seen ling in a shop any time, though I know that it is caught off the West of Ireland, where the Irish have always eaten it. But it never made it to the shops in our part of England [North West.] Coley was eaten in Scotland, where it is commoner in in-shore waters than it is on the English coast. I really admire how the women found inventive ways to feed their families. Another fish that might have made its way onto dinner plates is horse mackerel. A number of species are covered by this term, but the Atlantic horse mackerel, also known as the scad, is an abundant fish. Although not in the same family as the mackerel, the two fishes have similar tasting flesh. Snoek was a very cheap imported fish and regarded as ersatz, a poor imitation. But resourceful Post war cook made a meal of It . It is like mackerel an is known as Barracuda or sierra in other part of the world. I am posting a 1948 recipe for Snoek. Not at all. I love a challenge and this was very interesting. I get so many history requests and love searching through books and newspapers . The internet has take the joy out of looking things up in books I think. If I hear of something I shall let you know on this page. Thanks for trying Veronica. I think I just misremembered after 70 years! Snoek was the word but I was wrong. Some say getting their children to eat vegetables is not luck; they say it is their own wonderful parenting. OK Well done you, for being so perfect ;but it isn't always that easy. Although not as well known or as filling as Lancashire recipes, Cheshire traditional food is just as good. Cheshire was originally an inland salt lake and the soil is salty.